This island ranks #4 of the "Mariana Islands"
There are only a few hotels in Tinian island. In many cases, it will be more reasonable to stay at Saipan island, and fly here for a daily trip. Fly to Saipan International Airport (SPN). Next fly to Tinian Airport (TIQ). Please note that there is no ferry service between the islands of Saipan and Tinian. It's not so bad as the air service between the islands is convenient and cheap. The best time to visit Tinian island is the dry season from December to May. 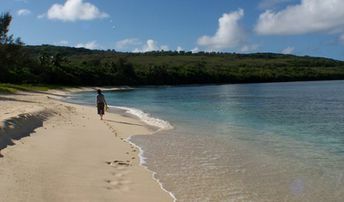 Tachogna beach is one of the best on Tinian island. And it is not wide known. So no crowd anytime. Chulu beach is not so good, but it has a lot of artefacts from WWII. Long beach is good for sunbathing and for snorkelling.